When you were first introduced to the world of video games, did you start off with the old school classics like Pac-Man, Asteroids and Space Invaders? If you have answered in the affirmative, there is just this particular sense of urgency that surrounds the entire level, especially when the aliens are getting way too close to the ground base, and your defenses have worn thin while you find it real hard to take aim and get rid of the advancing forces – not to mention having the music speeding up to add tension to the situation. Another equally tense game, albeit a non-electronic one, Jenga, is also a blocky game – literally. What happens when you marry Space Invaders and Jenga together? Why, you end up with the $29.95 Space Invaders Jenga, of course! 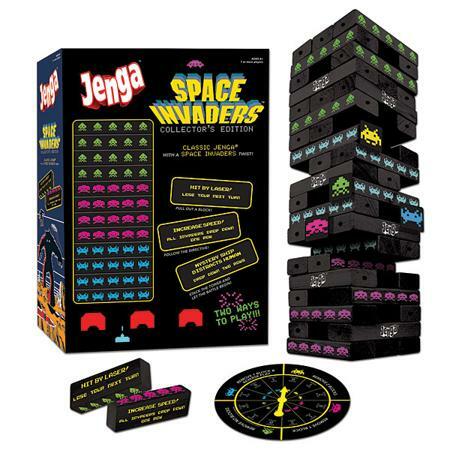 The Space Invaders Jenga brings about an arcade twist to an old classic, where this Space Invaders-themed Jenga set delivers a second type of game play. Each time you remove a block, you also happen to make an attempt to move your Invader down the tower, allowing you to “kill” them puny humans. Each of these blocks will come with an assigned action that will need to be followed through, where some of them will help, while others hurt. The winner would be the one who successfully makes it to the bottom.